Discover unique gifts at Queer Fayre’s pop-up stalls, drop into a talk or tour and don’t miss English National Opera. With delicious festive food and mulled wine, this is the great seasonal treat for all. 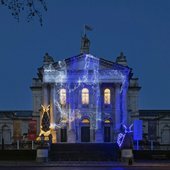 The Winter Fair is also the perfect opportunity to see Turner Prize nominee, Monster Chetwynd’s, Winter Commission as she takes over the Tate Britain façade. You can also get discounted £10 tickets to see Edward Burne-Jones and the Turner Prize during the fair. Hosted by Wotever World, drop by the Queer Fayre for a range of unique crafts, illustrations, jams and more. Some stall holders accept cash only, please come prepared. A perfect way to start your weekend, join yoga and well-being practitioner Sahara Evans for a series of free yoga workshops. Suitable for all levels, no need to bring a mat just you and your good vibes. This your chance to become the drummer you have always dreamed of being. Drop into the Duffield room for Abundance Art’s free workshop. Join a special tour of Tate Britain’s collection. Inspired by Winter and the marvels that come with it, this tour will take you on a unique walk through British art. Burne-Jones is famous for his sumptuous depictions of myths, legends and fairy tales, from Arthurian Romances to the stories of Sleeping Beauty and Cinderella. Join artist Rebecca Leach McDonald for a tour of the Myths and Legends within the Edward Burne-Jones exhibition. Limited tickets are available. Join Deaf Guide Rubbena Aurangzeb-Tariq for a tour delivered in British Sign Language of the magical works in the Edward Burne-Jones exhibition. These short talks will reflect on the themes of the artworks in our free collection displays. Join us for an informal and open conversation about key artworks in our free collection displays, including Joseph Mallord William Turner's The Angel Standing in the Sun in the Turner Collection and Henry Moore's Family Group in the Spotlights Display. Join us to hear live storytelling of the fairy tales within Edward Burne-Jones's work, including the stories of Sleeping Beauty and Cinderella. Drop into the Clore Schools room to decorate delicious gingerbread men with lots of festive icing and edible decorations. Grab a mulled wine and a mince pie from the Djanogly Café or head over to the Rex Whistler for a Christmas meal. Plus our prosecco and cocktail bar will be serving festive cocktails, craft beer and seasonal soft drinks. Tickets for Edward Burne-Jones and Turner Prize 2018 will be at the reduced price of £10 between 10.00–18.00.